Ten things every believer must do. AN EYE TO THE CROWN is a book written to make you a winner in this life and to gain the crown of victors when your earthly race ends. Who are those who win the crown? How does one live in order to win the crown? That is what this book is about. It deals with ten simple steps that will position you to live that full and victorious life and win the ultimate prize. “The passion of the author transpires through every page and conveys a message of hope, faith and a new beginning through Christ. A Christian literary treasure; a classic in the making”. Shakespeare famously, echoing earlier sources, stated that the world is a stage and all the men and women merely players. More profoundly, in I Corinthians 9.24-27, Paul the Apostle compares the Christian life to a race, to games in which every one participates but only some go away with the prize and the crown. Yet all are expected and encouraged to live in such a way as to win the crown. That is what this book is about. It deals with ten things that will position you to live that full and victorious life and win the ultimate prize. 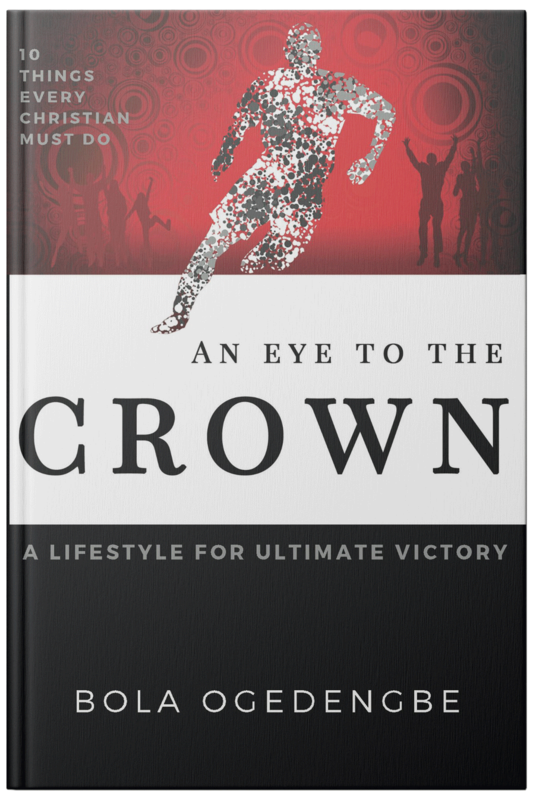 An Eye to the Crown presents in an engaging, open and clear manner, spiritual choices and disciplines that make for a lifestyle for present and ultimate victory. Ten chapters – Go Tell, Worship and Fellowship, Serve, Fast, etc. Each topic is explored and explained biblically, with personal stories, and challenging testimonies from great men and women of the past as well as church history. It is for those who are willing to undergo a radical shift in perspective and lifestyle. It will inspire you, it will encourage you and properly followed, the principles in this book will ensure you live a beautiful life. BOLA OLIVIA OGEDENGBE is a seasoned bible teacher, founding pastor of ABBA HOUSE Church, Paris, France and head of the Theophilus Company prophetic ministry. Her television programme ‘Passion pour Dieu’ reaches a global audience. She is a gifted blogger and writer. Her books convey a contagious passion for God. She worked for more than twenty years as a conference interpreter for major international organizations and government agencies as well as private sector clients before going into full time prophetic, teaching and pastoral ministry, and she has never looked back. She speaks five languages and has travelled to over 150 nations. She has a heart for the expansion of the gospel and the consolidation of the church in the nations. It is available in hardcover, paperback and ebook (kindle, epub) from online retailers worldwide. You can also order easily from your local bookstore. Get the 30 day devotional based on the book REBORN A NEW IDENTITY absolutely free when you sign up for blog updates.